As I spend much of my spare time “living” in the 19-teens while working on a novel about Hedda Burgemeister and Otto Koehler, the opportunity to hear Barbara Kingsolver (The Lacuna most recently) and C.M. Mayo (The Last Prince of the Mexican Empire) numerous times throughout a five-day period was irresistible, as though the setting of San Miguel alone would not be tempting enough. My daughter Kate discovered it – the San Miguel Writers Conference – while exploring C.M. Mayo’s website or blog, and my amazingly-generous husband Lamar decided to give the experience to the women in his family as a Christmas present. 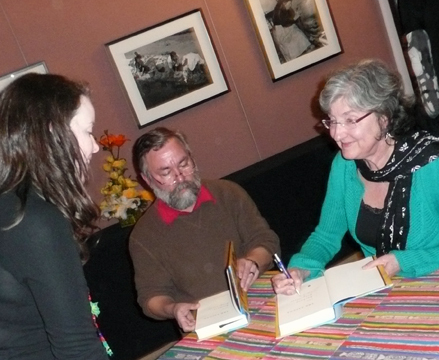 Barbara Kingsolver signs a copy of Lacuna for Kate. Although I make my living “translating your thoughts into words,” I had not thought that much about the mechanics of writing since my last class with Mrs. Masterson my senior year in high school. The conference was well worth the journey, and, hopefully, my clients will benefit. Note added on March 4: Literary agent Nathan Bransford blogs about his conference experience in San Miguel de Allende. Note added on March 15: An attendee at an evening event we unfortunately missed describes the “street food” served and throws in a photo of Barbara Kingsolver taking a swing at a Stalin pinata. Also: Sandra Gulland’s notes from one of Barbara Kingsolver’s talks during the conference in San Miguel de Allende. This entry was posted in Flavors, Mexico, Travel, Written Word and tagged Barbara Kingsolver, C.M. Mayo, San Miguel Writers Conference, The Lacuna, The Last Prince of the Mexican Empire. Hi. This is another comment. I know, hard to follow up an act like Mr WordPress’ but given that this is my dear friend Gayle’s blog, I had to break it in appropriately…. Thanks for the mention; so glad to have had you in the workshop! By the way, I should have mentioned when we talked after the workshop, that if you join the Author’s Guild http://www.authorsguild.org (something I recommend to everyone who has a book contract), one of the benefits is that their legal staff will review your contract and also, as far as I recall, they offer plenty of advice about what does and does not constitute “fair use.” They also offer phone-in conferences for members, which I have found very useful. Good wishes to you for your book! Thanks so much, Catherine. I will look at the site immediately, as I am expecting paperwork from the woman who will be editing and overseeing the printing of The Last Farm Standing on Buttermilk Hill today. Thanks for the link. The food really was incredible that night (ohhh, the tamales and gorditas! ), and we were so happy to be able to attend the event. Of course, Barbara Kingsolver and a Stalin pinata will always make for a great photo.